Innovative bass player and composer, Barry Guy, who is also founder and Artistic Director of the London Jazz Composers Orchestra, has been awarded an Honorary Degree by Middlesex University. Barry Guy’s creative diversity in the fields of jazz improvisation, chamber and orchestral performance and solo recitals is the outcome both of an unusually varied training and a zest for experimentation, underpinned by a dedication to the double bass and the ideal of musical communication. He was presented with an Honorary Doctorate at the University’s graduation ceremony today. “I am honoured to be associated with this university and will endeavour to continue working in a manner that advances the name of this august establishment,” said Barry. Barry Guy is founder and Artistic Director of the London Jazz Composers Orchestra and the BGNO (Barry Guy New Orchestra) for which he has written several extended works. In 2014 he founded the “Blue Shroud Band” to perform his composition “The Blue Shroud” based on Picasso’s painting “Guernica” with texts by the Irish poet Kerry Hardie. His current regular ensembles are the Homburger/Guy duo, the Parker/Guy/Lytton trio, TARFALA (with Mats Gustafsson and Raymond Strid), two new trios: BEYOND with Jürg Wickihalder (sax) and Lucas Niggli, (perc.) and HEAVY METAL RABBIT with Lucien Dubuis (bassclarinet) and Alfred Vogel (perc. ); as well as various piano trios: AURORA (with Agusti Fernandez and Ramon Lopez), HEXEN (with Paul Plimley and Lucas Niggli) and the longstanding trio with Marilyn Crispell and Paul Lytton. 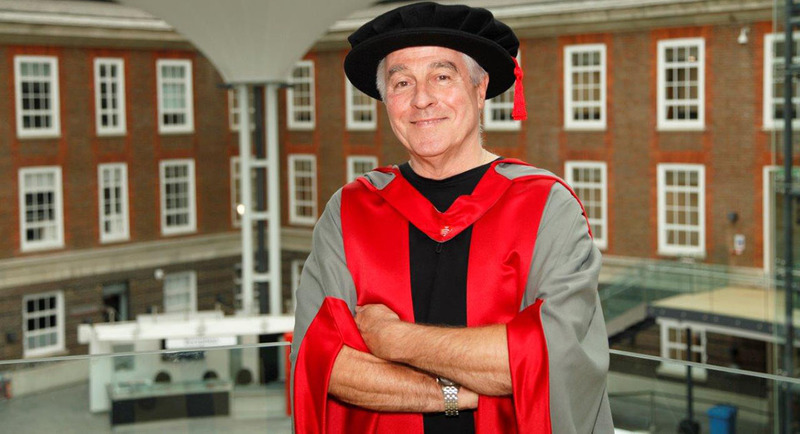 “It is a real privilege for Middlesex University to be able to recognise expertise, public duty and creativity by offering outstanding individuals one of our Honorary Degrees," said Vice-Chancellor, Professor Tim Blackman.